Each scholar will be assigned a “mentor” from the Senior Management Team and selected Management Team. The mentor is to provide consistent and continuous mentoring throughout the duration of the scholar’s programme. This is to ensure that the scholars have the necessary support and are able to leverage on their mentors’ experiences. 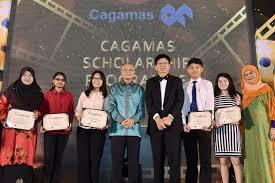 Applications will only be considered if they meet the eligibility criteria; the specific field of study and the list of colleges and universities as approved by Cagamas. You may submit your application prior to receiving offer letter of admission from any colleges or universities approved by Cagamas. However, any offer of scholarship will be conditional upon you meeting all necessary conditions and securing admission into one of the eligible programmes at one of the approved colleges or universities. CLOSE DATE : 28 JUNE 2019 | APPLY NOW! !